Have you ever played a tag game? Sure, we all did as kids! But what about an adult version for card makers? Now I'm talkin' right!!! That's exactly what we did at the end of last week over at StampNation. All of the participants were assigned to a team randomly. The first person on each team received a link to a card in the StampNation Gallery. That person had 48 hours to create a card that CASEs the linked/photograph of the card they are assigned. Once that person had CASEd that card, they emailed a photo of their completed card to Ally and she passed it along to the next person in line on their team via email. It continues on down each list of participants on their team. What you wind up with at the end of the game is a CASE of a CASE of a CASE...you get the idea. The card above was my submission to the game. Since I had Pretty Peonies out from my Throwback Thursday projects, I decided to use it again (I love that set!). 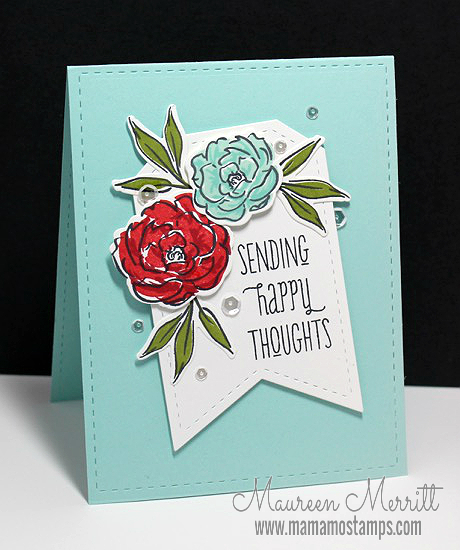 I pulled the colors and use of a die cut as a focal point from the card I was given to CASE. This is one of my favorite colors combos. I don't use it much during the Winter season, so it was fun to use them on my card. We do so many fun things like this at StampNation. If you haven't joined yet, you should! Click here to learn more about membership benefits and to join now! This is beautiful Maureen I love the colors and those pretty flowers! Pretty Pink Posh is One!